In 2012, I built a new modern home with a flat roof, floor to ceiling glass, and walls of raw concrete. Once the inside was complete, I was excited to begin working on the landscape. But moving from a 1907 farmhouse to a new modern home, I found I had to rethink my thoughts on garden design. After studying plenty of pictures of modern garden designs, I noticed a pattern. Most modern landscapes featured angular, defined spaces with a limited pallet of plants. Another key feature was bringing the outside in and the inside out. Given the wall of glass, I knew I needed to frame some of the garden from the best indoor vantage point. One of the main tenants of modernism, which I wanted to include and respect, was to pay attention to uncluttered space and volume. The feeling of serenity that springs forth from this approach can be understood in the same way an uncluttered workspace or home can bring inner calm and relaxation. However, as a plant lover and collector, I wondered how was I going to manage within such constraints? Were there ways I could use only some of the tenants of modernism and still achieve the aesthetic? I learned the modern aesthetic can be incorporated into a more traditional design and thus add another dimension to the landscape. It’s the same way that an “Asian influenced garden” may not be a true Japanese garden, but it can bring a fresh new look to your landscape. People enjoy looking at new things or old things presented in unexpected ways. Why? Simply because they are visually satisfying and stimulating. As an example, if you see the same types of trees repeated in the landscape, much of their visual power is lost. You will either quickly identify that particular tree or become bored, and your attention moves on. Yet if these same trees are used in unexpected ways, such as in a grid formation or pruned into an abstract shape, they achieve greater visual power. Using plants in unexpected ways and adding unusual plants brings spirit to the landscape. During my planning stage, I recalled a visit to Iseli Nursery’s office building and display gardens in Portland, Oregon. The landscape was stunningly beautiful. 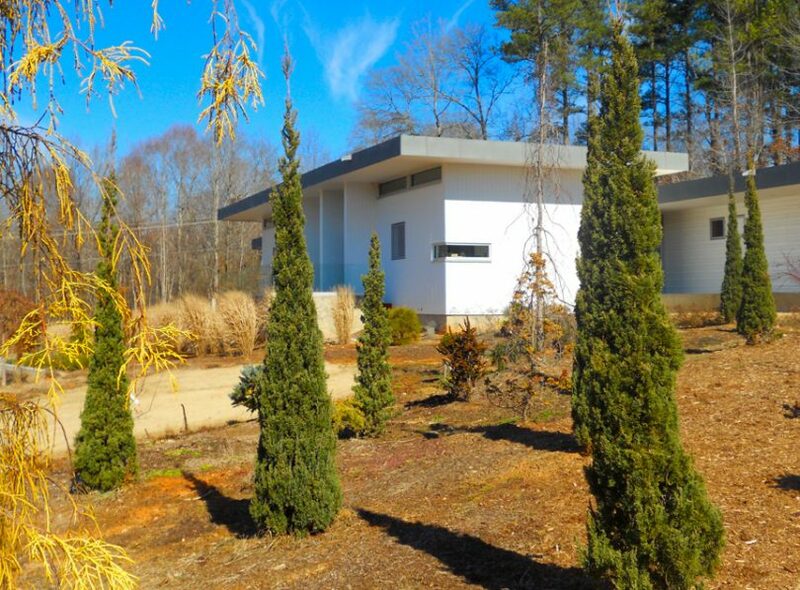 The garden of conifers and Japanese maples enveloped the imposing modern office with bright colors, tight habit, and varied shapes and textures. The gardens complimented the modern architecture of the building. If I could create even a semblance of that garden I would be satisfied! With a passion for conifers, I knew I would have to reserve some space for a conifer garden. Knowing that direction, part of the problem was now solved, but there was still much to figure out. I was not exactly sure how I would proceed until I came across a group of super tall, multi-grafted Japanese lace-leaf maples, Acer palmatum ‘Orangeola’. I planted five of them in a modified grid pattern and under-planted them with the low growing juniper, Juniperus chinensis ‘Daub’s frosted’. Although the maples are deciduous, their branches don’t seem so naked in the winter months with the colorful evergreen foliage of the junipers planted beneath them. I also added large masses of a wonderful upright switchgrass, Panicum virgatum ‘Northwinds’. It looks great all summer and the winter presentation of tan foliage is equally attractive seen against raw concrete. My landscape, so far, would not be called a pure modern landscape. However, it has elements from that perspective that I love. If there is a lesson here, it might be not to get too caught up in some of the rules, but to allow yourself room to play and enjoy the process. It is your garden after all. Featured image by John Monroe. John Monroe gardens in Bahama, and owns Architectural Trees, a specialty tree nursery also in Bahama.